Widgets move around the page by themselves. They are like Ghosts! Do widgets move to other places than you place them by themselves? For about a week now, I have ONE widget (but not always the same widget) on each page that moves to another location all by itself. You won't know until you preview the site and notice something's been changed around. To fix it, you must refresh yola's sitebuilder and then you'll see it in the different spot and you have to put it back then save. Is this a bug Yola's dealing with? And no, it's not my cookies and stuff because it happens right after I delete all those. I am using Internet Explorer 8 (my prefered browser). This is very weird... I'm getting it too? Similar issue, widgets tend to migrate up the page, I just thourght it was the Yola sitebuilders dislike for me! that's exactly what happens... they move up. For me, it's only one widget but it happens for all pages whenever I edit them. It doesn't seem like it happens in the sitebuilder but when you preview page a widget has moved. has a "ghost" that you can can move to where you want it without problems, and let it stay there. Compare that to other FREE sitebuilders and you will come back to Yola. Allways use all the space that you want to be blanc and fill it up with..
Any template has another but simulair "ghost" ,but hey isnt that part of sitebuilding? Being free is not any excuse really is it! @Yoogle: thanks for your support. However, please note that Yola never offers the fact that we are free as an excuse for bugs or poor service. In this instance the most likely cause is with custom code on the page as suggested below. @Rob: please try Boomer's suggestions and let us know if that solves your problem. Sorry, i will read better next time. Can you please point out the particular widget that seems to be moving about on you? If would be helpful if you could post a screenshot of what it looks like in your site builder and what it looks like on your previewed site. well, I attempt to fix the issues as they come about. Which takes about five minutes each time. Right now I don't have a screenshot to show you, it appears I must've deleted the previous one. Right now I'm about to eat lunch but after I have another issue I'll take the screen shot and show you. I even wrote an email to support and provided them with an url to a screen shot discussing the situation. Wonder if they ever looked at it before the problem was solved and I deleted it. It's not any one particular widget. It could be anywhere from my donate button moving up the page, to a heading widget, to my bottom menu. It'll be in the CORRECT spot on the sitebuilder but on the preview page it's in a different spot. If I then refresh the sitebuilder, the widget will be in the same spot as on the preview page spot... but I NEVER moved the widget to this spot, it moves automatically. And it appears I'm not the only one with the problem, maybe it's a yola bug. I have to wonder if Rob.B. is also using internet explorer 8. 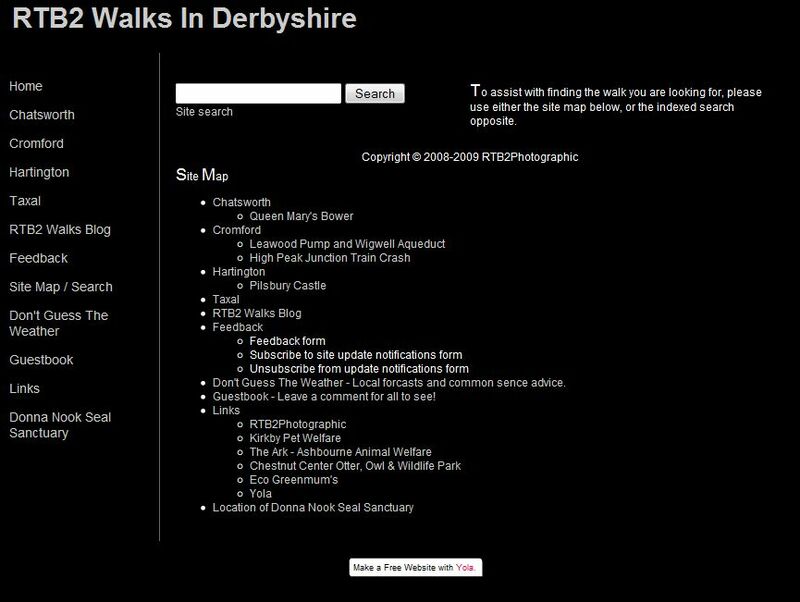 Basically the HTML widget on the site-map .php page (contains the site-map) moves to the top above all others on a regular basis. The other nomadic widget is the copyright containing HTML (again) widget on most pages, these widgets seem to enjoy exploring different positions on the page. I had a look at your source, and found a few issues with your "unordered list". and see if it solves the problem. and no... I doubt it's the cause because I don't have these issues and I have widgets moving around the page. Maybe you should tell these guys they have been doing it wrong all this time! An unordered list is a list of items. The list items are marked with bullets (typically small black circles). An unordered list starts with the <ul> tag. Each list item starts with the <li> tag. Inside a list item you can put paragraphs, line breaks, images, links, other lists, etc. nowhere in there does it say it's required. It just simply uses them in the example. Also, you'll notice that I've done it above.. do you see my bullets? Of course you do... and no... I didn't use ending tags after each list. I never do. I've also read somewhere that NO ending tag is required as long as it's the last thing in that widget. Firstly, as I mentioned above, Rob has left out some opening tags and has misspelled some closing tags. Is this also OK ?? nope... I wasn't indicating specifically what he was doing was ok or not ok, I was simply suggesting ending tags <!-- <li> --> aren't required. But it could cause problems to mispell them and to not include necessary beginning tags. Beginning tags ARE required or else a new bullet won't be included. Also, misspelling an ending tag usually won't cause a problem UNLESS that misspelling is another tag. For example, <!-- <il> --> is not a tag which is currently used in HTML 4.01 but possibly in HTML 5 by 2022. Right now, HTML 4.01 will probably ignore an ending tag of <!-- </il> --> because it's non existent. So do I believe that an ending tag of <!-- </il> --> will cause problems... no... but do I believe (or know) that not including a beginning tag will cause bullets to be unlike what you wanted, YES. when you customize lists yourself through html, I would just recommend not including closing tags after each list because that's extra work. But you still have to have the closing tag for the whole list <!-- </UL> --> or otherwise anything after that point will also be bulleted. My widgets don't move.. they are invisable! I had this problem a couple days ago and they were back the next morning. Now they are missing again. Sigh.I will wait till morning, but I would like to understand why this is happening. Hi Kimberly - Please can we have the URL of your site. Is there a particular page on your site this happens on? Good morning Kershnee. The URL of my site is http://www.finddance.info/ and the page with the missing widgets is http://www.finddance.info/line-dance.php I tried html box and the google widget.Both are invisible. Thanks for taking a look at this! Kershnee is currently offline at the moment. I hope you don't mind me stepping in on her behalf. Can you clarify what widget is missing? What were you trying to add? Can you please try adding them again so that we can take a look at what's going on? Thanks. I will take a look at this now and see what's going on. The code that you have for one of your widget, the one with a tiny gray box, I wonder if this is correct? Can you please double check the code? Also, I am able to see your amazon widgets at the bottom - both are the same ad - Ultimate Line Dancing? Can you confirm if that is what your visitors should be seeing? I see all the widgets now too. I tried several different ones, since I didn't see them I seem to have doubled up. I tried an entirely different widget. Maybe some of them have an error on Amazons site. I will keep experimenting with them. Thanks so much for your time! You're welcome Kimberly. If you would still like us to address the gray box issue - please let us know. I do believe though that there is an error in the coding of that particular widget. Perhaps you can try replacing it with something else if it does not work? p.s. Your site totally made me want to learn how to do the dances! :) I love dancing! Thanks Saja, Make sure you come back and look at the dances later.. I have barely started on the site. I love to dance too. That is the reason I started with Yola a year ago... to make my site BransonNightlife.com I wanted to share info about places to dance and hear live music. Hi Kimberly, I had a question... I've often wondered about selling things using Amazon because I see it often. It "seems" those aren't "YOUR" products you're selling... do you get a commission for selling items on your website and how do you get started with that? Hi Donald, you are right, the Amazon is an affiliate program paid by commission. You can get started through Amazon. I can't tell you how lucrative it may be as I am only starting. I have not been able to add my widgets as of yet. With my great Yola support I should solve that problem soon. I suppose like any other affiliate program it depends on your audience and website traffic. I am always looking for a new adventure! yea, right now my income's not that great. I got one $20 donation "a friend gave me" through my website's donate button and made $30.99 in advertising for AdSense over the course of 8 months... so I'm always looking for ways to make more money. I have made a total of 12.51 from adsense in over a year, which I will never see I'm afraid. http://www.bransonnightlife.com/ I have been building sites and that is a much better deal. And i get to "Do what I love... love what I do" :) Good luck to both of us!!! Caught one on the prowl! I added a new line to my sitemap page, and the copyright footer went for a stroll. The wayward widget has now been dragged kicking and screaming back to it's rightful place on the page!! 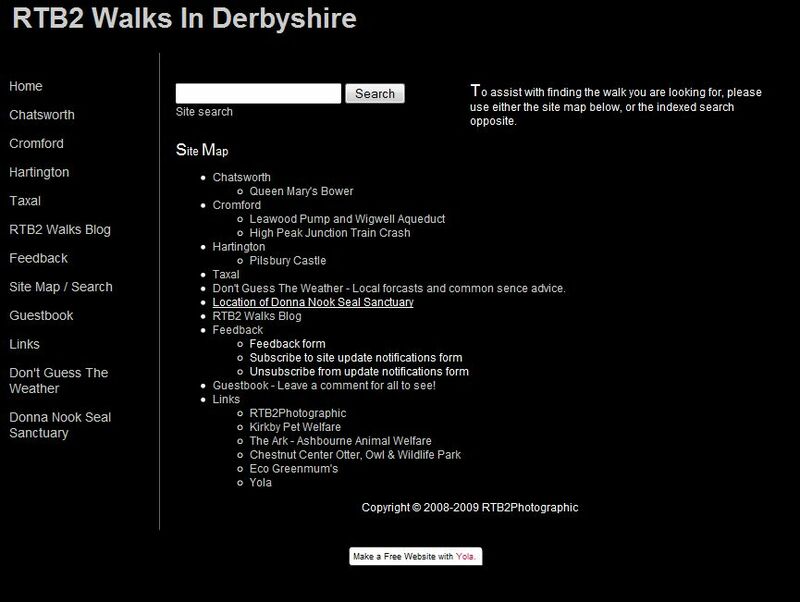 All I did was open the HTML widget containing my site map and add an entry for "Don't Guess The Weather". Nothing was dragged or dropped during this edit. yep, that's exactly what happens... I even sometimes have my copyright widget moving up. Same problem, first I thought someone was hacking my page and playing tricks on me but I soon realised it's a bug and a very nasty one at that. Makes you look unprofessional when it happens. It seems to be the Paypal shopping cart widgets thet move mostly but it has been text widgets as well. They always land themselves up the page. I think you should make this a priority to fix. Thanks for your message. Can you please share your site URL with us so we can take a closer peek? It looks like an HTML issue to me. I have notified our code team who will hopefully be able to assist you further. Please allow them 24 hours to check your site and respond to your post. Thank you for your patience. I don't see anything right off the bat that would explain this issue. As you say that it happens randomly, it is difficult for me to pinpoint the cause. I do wonder if your Flash and Java are updated? Can you please try updating these two things and see if that helps at all? Also, what browser and version are you using? Will you be able to try using a different browser to see if this yields any improvement? Is there any further steps or information you can share with us so that we can attempt to replicate this issue and pinpoint the cause? Thank you for your patience as we work on this together.